The Karakal Colombian Squash Open was played last week at the prestigious Los Lagartos Country Club in Bogota. 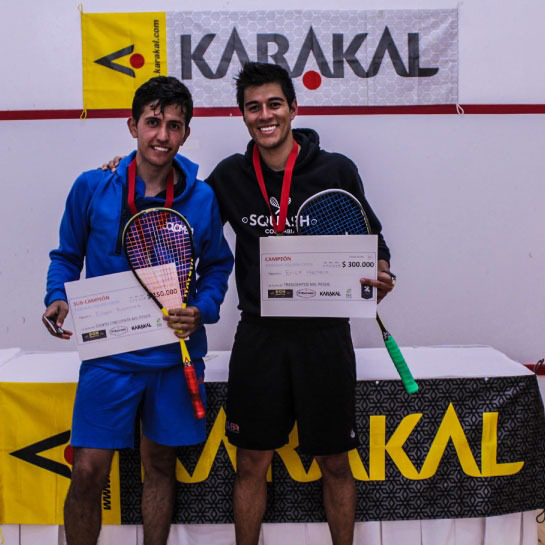 This was the first tournament organised directly by Karakal Colombia, with 120 players competing and over 300 assistants helping to make this major event a resounding success. The Mens final was played between two of Karakal's Colombian stars, Edgar Ramirez and Erick Herrera, with reigning Colombian National Champion, Erick taking the title. The junior title was won by Agustín Gaviria with Simón Figueredo as the runner-up and the Children's category title was taken by Massimiliano Schonlau, who beat Lorenzo Sanmiguel in the final. Additional sponsors: TFC Open Camisas Zeta, Pisapore Italian Restaurant and Don Benitez Mexican Grill. To see more photographs from the event visit the Karakal Colombia FaceBook Page or our Karakal YouTube Channel.